It’s October, when vampires and werewolves and mummies go out in the cold, dark nights, scaring folks for candy and treats. The Kelsey’s own mummies know a thing or two about wandering outside as well. Just earlier this month, the cat mummy, grain mummy, and one of our bird mummies made the trek to the University of Michigan Hospital to get CT scanned (see “Grain mummy goes to the hospital”). These three are not the only mummies from our collections that have made such a journey. 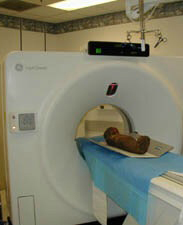 In 2002, curators Janet Richards and Terry Wilfong, along with student Grant Martin (who initiated this scanning endeavor), took our child mummy (KM 1971.2.179) to the hospital system to be scanned as well. This month’s “From the Archives” highlights this fun and unique adventure. The archives at the Kelsey hold not only the story as written by Terry and Janet, found in the Spring 2002 Kelsey newsletter, but also correspondence, reports, and other ephemera associated with the event. On display this month are a scan of the 2002 newsletter, where Terry and Janet detail their middle of the night adventures driving a hearse and being welcomed by the staff of the hospital excited to see the VIP guest. Along with their tale, we present two pages from the report written by Martin Grant, where he explains some of the findings from the scanning, including some visuals of the scans themselves and the making of the resin skull (currently on exhibit in the Upjohn Exhibition Wing). Thrown into the mix is the original outgoing receipt for this transaction (collections managers document all movement of objects leaving and arriving at the Kelsey). It is humorous, in a way, to read the simple note on why the object is leaving. “[O]ne mummy of a child from Kelsey Museum collections for scanning in UHospital after hours.” It is written so nonchalantly, as if a regular occurrence for us. This simple phrasing hides the excitement and buzz from the experience, and the depth of knowledge we acquired as a result. This was not the first time this mummy received such attention. Many years earlier, the mummy was x-rayed, and that image is shared here as well. As much as this photograph shows us, developing technologies still offer us a greater chance to learn about our artifacts. Maybe in another 10 years, a new machine will come about that will reveal even more about our artifacts, and our mummy will go off in the night again. When it comes to the Kelsey Museum of Archaeology’s collections, not all artifacts are created equal. Some call out to us intellectually, others emotionally. BY RICHARD REDDING, Research Scientist, Kelsey Museum of Archaeology; principal investigator on archaeological projects in North Africa, the Middle East, and Asia; Chief Operating Officer and Chief Research Officer of Ancient Egyptian Research Associates. Redding works in Giza, Egypt, during dig season. Front, inside, and back views of the Djehutymose coffin. Favorite Artifact: The Coffin of Djehutymose. Mummiform coffin of the priest Djehutymose. Wood, plaster, and paint. Saite period (26th Dynasty, 685–525 BC). The coffin, carved to represent the mummy of Djehutymose, is covered with magical spells from the ancient Egyptian Book of the Dead and images of protective gods and goddesses. In this way, the identification of Djehutymose with Osiris is reinforced, and he is provided with multiple levels of protection against the perils of the afterlife as well as appropriate spells for the successful continuation of life in the world of the dead. The coffin represents a microcosm of the afterworld and the eternity that Djehutymose expects to enjoy. Lid Exterior: Djehutymose’s face is green in imitation of the god of the dead, Osiris; the color symbolizes regeneration and rebirth. His false beard is characteristic of Osiris; his collar with falcon-headed terminals is another symbol of rebirth. His name reinforces his personal identity throughout the texts on the coffin. The goddess Isis, wife of Osiris, spreads her wings protectively over Djehutymose’s feet. A snake encircles the entire coffin lid, its tail and head meeting above Djehutymose’s feet. This circled snake symbolizes protection and eternity. Lid Interior: The sky goddess Nut spreads her wings protectively over Djehutymose’s chest. Nut’s crown is a sun disk containing her name, and she holds powerful ankh (life) symbols in her outstretched hands. The two eyes of Horus (wedjat) symbolizing protection and rejuvenation are confronted on either side of her head. Base Exterior: Protective texts from the Book of the Dead and processions of gods and goddesses line the sides of the coffin. Base Interior: The goddess Imentet magically embraced Djehutymose’s mummy as it lay in the coffin. Background: For much of Egyptian history, the bodies of the dead were placed in coffins, which often bore texts giving the names, titles, and parentage of the deceased, as well as religious texts for provisioning, protection, and regeneration in the afterlife. Djehutymose lies on a funerary bed, where he is being embalmed by the jackal-headed god Anubis. His soul (ba) in the form of a human-headed bird, hovers overhead. Beneath the bed are four canopic jars containing Djehutymose’s internal organs, removed during the mummification process. “Fashioned nearly 2,600 years ago, the Djehutymose coffin has made a complicated journey into the present. In the intervening centuries, the coffin was separated from Djehutymose’s mummy, now lost. Within the last hundred years, Djehutymose’s coffin traveled far beyond the imaginings of the ancient Egyptians: from Egypt to Ann Arbor, Michigan. Donated to the University of Michigan in 1906, the coffin was long on display at the Kalamazoo Public Museum before it returned to Ann Arbor in 1989,” according to the Kelsey publication, Life, Death, and Afterlife in Ancient Egypt: The Djehutymose Coffin. @RockaroundCroc, a crocodile mummy at the British Museum in London, UK. Find: Look for the coffin of Djehutymose in a prominent exhibit case in the middle of the first floor of the William E. Upjohn Exhibit Wing of the Kelsey Museum of Archaeology. The coffin stands tall and open, with the interiors of the lid and base facing visitors. Exteriors of the lid and base can also be viewed from the back of the exhibit. Learn More: Life, Death, and Afterlife in Ancient Egypt: The Djehutymose Coffin in the Kelsey Museum of Archaeology, by T. G. Wilfong, available in our gift shop or online. Find out more about Richard Redding’s work in Giza, Egypt, at http://www.aeraweb.org. Curator T. G. Wilfong and Conservator Claudia Chemello prepare the child mummy for installation in its simulated tomb. BY TUNICIA ROSS, Custodian, Plant, Buildings and Ground Services, Kelsey Museum of Archaeology, University of Michigan. A 24-year employee of the university and mother of two, Ross has been taking care of the Kelsey for the past two years. Favorite Artifact: Mummy of a child. Human body, cloth, resin, wood. Roman period (1st century AD). Fayum region (? ), Bay View Collection 1971. KM 1971.2.179. Why. When I thought about ancient times before I came to the Kelsey, I imagined adults living then, not children. So the mummy of a child was very eye-catching to me when I first saw it. As I cleaned the glass (Plexiglas) panel in front of the exhibit, I realized it was not just an ancient mummy. But a real child who had lived more than 2,000 years ago. As a mother, I connected immediately. After two years at the Kelsey, this child mummy still draws me. It also draws a lot of children! Museum rules caution visitors against touching any exhibits, but children leave more fingerprints on the child mummy’s viewing glass than any other exhibit case (except for the Djehutymose coffin). This means I am often at the child mummy’s side, cleaning the glass. To clean Plexiglas, we use a special cleaner that doesn’t leave scratches. I first spray cleaner onto a cotton cloth before using it to wipe off fingerprints. We never spray cleaner directly onto museum glass because some exhibit panels have open spaces between them. If we sprayed directly, the cleaner would squirt between the open spaces and damage ancient artifacts. One of my position’s perks is the opportunity to catch up with ancient history as I work. And when the curators and staff work on a new exhibition, it’s kind of exciting to see their preparations and the artifacts up close before the opening. About Artifact. The anonymous child mummy probably dates to the early Roman period (1st century AD). We know nothing of the circumstances of its burial or discovery. The mummy came to the Kelsey from the former Bay View Collection, where it had been since the 1890s. This mummy is displayed with pottery from roughly the same period (from the U-M excavation at Terenouthis, Egypt) to approximate what the burial — perhaps made in a pit grave — might have originally contained. In doing so, we hope to have struck a balance between respecting the wishes of ancient Egyptians while accommodating visitors’ interest in learning from this mummy. Child mummy about to undergo CT scan. In 2002, an undergraduate engineering student undertook a project that led to a new investigation of this mummy through CT scan, undertaken at the University of Michigan Hospital. The resulting images revealed the enormous amount of linen used to bandage the small child’s body, a wooden framework used to stabilize the body during embalming, possible postmortem damage of the skull, and the surprising fact that the child’s left hand had six fingers. The CT scan images were further used to construct a virtual 3D model of the body beneath the bandages and an actual polymer resin model of the mummy skull. The technology has allowed scholars to investigate this mummy in a non-destructive and respectful manner. Background. The anonymous child’s mummy hints at the sometimes harsh realities of life in ancient Egypt: child mortality was high, and children who did survive lived in a world that could be dangerous. Many artifacts from the University of Michigan excavations in Egypt (1924–1935), including dolls, toys, and images, show aspects of children’s lives: how they looked, dressed, played, ate, and learned — and died. Find It. Look first for the Djehutymose coffin in the center of the first floor of the William E. Upjohn Exhibit Wing of the Kelsey Museum of Archaeology. While facing the coffin, turn slightly to the left, then slightly to the right. Now walk straight back to the wall where you’ll find a discreet glass panel built into the wall behind which the mummy of a child rests in a simulated cave burial. Learn More. Life, Death and Afterlife in Ancient Egypt: The Coffin of Djehutymose, by T. G. Wilfong, is available in our Gift Shop or online at https://www.isdistribution.com/BookDetail.aspx?ad=34777.